Flights via Paris: Coming from Amsterdam we changed planes in Paris at Charles de Gaulle. In general a transfer of 1 hour is not enough for changing planes here. Malaria: We did not take any profylaxe as precaution. However on arrival we bought the local drug called Coartem. It is a natural drug that is effective and used widely in Madagascar. We carried it with us just in case we would get sick. Supermarkets: Western style supermarkets are only found in the bigger cities. A big one in Tana is the Jumbo (see waypoints). Also in Tulear is one where you can buy some good food before going offroad for a couple of days (see waypoints). Shopping list for 4 days offroad with 3 people (including guide): 12 bottles of 1,5 liters of water, snacks and fruits (there are enough restaurants for dinner on the way), Ariary in small notes (2 notes of 5000, 6 notes of 3000 and 10 notes of 1000). The small notes are needed for all kinds of "village taxes". We filled up our jerrycans with extra diesel in Morombe. Morondava to Tulear without guide: When you definitley want to go without a guide then the best way is to drive from north to south (easier for navigation). You do need some offroad driving experience. Nautamine: Locally sold drug for motion sickness (mal de mer). Works great. Internet: Available is almost every hotel. On the west coast in some hotels WI-FI was down. ATM's: widely available for Visa card holders. For other cards you might be limited to a certain bank. Creditcards: Visa is accepted in the larger hotels and restaurants otherwise you pay cash. Visa is by far the best card to withdraw money from an ATM. It is accepted by many brands of banks. At most ATM's withdrawel was limited to max. 400.000 Ariary. It was possible to withdraw this amount a few times at the same ATM. Safety: There are some places where safety can be an issue. Always ask local advise before going somewhere. During our visit zebu thieves robbed some tourists on the west coast. Investigate the situation before you go here. In Antananarivo we always had the doors locked whilst driving and our bags out of sight. Despite attacks in the area it was safe to visit Baobab Allee (many armed guards here to guarantee your safety). At the time of our visit also Tsingy was accessible but only with an armed convoy. Despite the precautions we never felt unsafe. Weather: In the highlands and in Antananarivo it was dry but often clouded during the day and quite chilly in the night. In the Tsaranoro valley it was dry and sunny but also cold in the night. Going south from here it was getting warmer. At the coast it was around 25 to 30 degrees and dry with comfortable temperatures in the night. Although dry we had some strong winds at the coast (making snorkling impossible). On the east coast the temperatures were around 22 degrees and we had rains during most of the days. Also here we had quite strong winds at some time even delaying the ferry from Ile Sainte Marie. We also had rain whilst visiting the rainy forests of Andasibe and Ranomafana. When you are visiting Madagascar during this period you better bring summer clothes as we well as warm clothes and some rain protection. Hotels: between 15 - 25 Euro on the mainland. On Ile Sainte Marie rooms were around 50 Euro per night. For EU citizen visa can be obtained on arrival at the airport. For this you must fill in an immigration card that is handed out as well as a health declaration that can found inside a booklet which is also handed out. At the first counter you hand over your health declaration. Here it is stamped for approval. With this stamped form you can then go to the next counter. Here you hand over the stamped healt declaration and you need to pay Euro 35,- (in cash - they do not have change) for the visa. After your payment you receive a form. With it you can continue to the last counter (immigration) where get your visa. Exit: It is forbidden to carry woodcarved baobab trees in your hand luggage. The officials also cannot handle digital boarding passes so even when you are already checked in you must go to the check in counter and get a boarding pass (this is stamped later). During check in they were very keen on the weight of our hand luggage. Too heavy and you must check it in. Ambositra - Ranomafana NP (partly offroad via Manandroy): 4 hours in total, nice trip. The offroad part took about 1,5 hours. Although a bit wet the track was fine. When rainy however it might be very muddy. Tsaranoro valley (4x4): from the main road to Camp Catta it is 1,5 to 2 hours. Best you have a 4x4 here. The tracks can rough in some places but are not difficult. Andavadoaka - Morombe (4x4): 2,5 hours. Morombe - Belo sur Mer (4x4): 10 hours in total. First 3 hours to the bac (very deep sand here). 3 hours from the bac to Manja. And 4 hours from Manja to Belo sur Mer. For navigation the part from Manja to Belo sur Mer are the most difficult. There are many tracks all unmarked leading to everywhere. You must be familiar here to know where to go. The main reason you need a guide is for this part of the trip. When you go the other way (from Belo sur Mer to Morombe) it is much easier to find your way. When you want to drive here without a guide then go from north to south. You do need some offroad experience though as some parts are tricky. Andasibe - Tamatave: 5 hours, through the mountains and lots of heavy loaded trucks on the road. Be careful driving this road. Road is curvy and tarmac has some unexpected potholes. Sometimes there are dangerous manouvres from cars trying to take over the slow trucks. El Condor, fast ferry to Ile Sainte Marie: Ferry leaves from the beach near El Piroque in Mahambo. Price 100.000 per person one way. Duration 3 hours (when the weather is good). In general the boat arrives at 9 am and leaves when unloaded and loaded again. This can be at any time (we left at 12 pm and arrived at the island at 3:30 pm). When you are in the right season look for whales. We saw many. In case you are sensible to motion sickness you can use Nautamine. It is a locally sold drug that works great. On arrival on the island you can go the office and directly make a reservation for your return trip. From the island back to the mainland the ferry leaves at 5 am. You must be at the boat at 4 am. As this is very early in the morning it is good to have accomodation near the harbour the night before you leave. Note: as weather can be unpredictable it can happen that the ferry does not go for one or more days. Sails can be cancelled at very short notice. Ranomafana: entry fee was 55.000 per person. On top of that you need to pay for the obligatory guide. Guides will be waiting at the entrance. Many of them speak English. Price for the guide is 75.000 Ariary for 3 hours and 110.000 Ariary for 5-6 hours. The price for the guide is per group so it worth sharing the costs if possible. We started with the short walk (3 hours). During the walk you can always change you mind a go for a longer walk (you just pay more at the end). Also you must pay a small amount for tax (2000 Ariary per person). Altough touristy we liked the park. In total we saw 5 types of lemurs. We saw most of them in the second part of the park (after we extended the walk). Be aware that the NP is a rainforest. It can be very wet (rainy) so bring rain protection just in case. Also wore special socks to protect ourselves against leeches (which can also be found in the park). However the risk to get attacked by leeches varies per season. During our walk we were the only ones wearing special socks and no one got bitten. We did not see any leeches. Ranomafana - chameleons watching: going up the mainroad there is a spot where the primal forest is covering both sides of the road. Here, after dark, you can find many chameleons. A guide can take you. We left at 7PM. We paid 20.000 Ariary per person. Tsaranoro valley: entry is 10.000 Ariary per person. Tax for the car is 2.000 Ariary. We slept at Camp Catta. The drive into the valley is amazing. Beautiful surroundings. From the camp you can arrange nice walks. We did the easy walk (3 - 4 hours). Costs for the obligatory guide is 50.000 Ariary. Isalo NP: entry 65.000 Ariary per person. Be aware that guides are used to tourists here and can be very aggressive when you try to find one yourself. We booked our guide through the lodge to make sure he was OK. Nevertheless we did not like him; though polite he was not very friendly. Fee for the obligatory guide is 80.000 Ariary for half a day and 120.000 Ariary per day. Tax is 2000 Ariary per person per day. We started with half a day and later extended it to a full day. In the morning we did a walk into a gorge to a cascade and the black and blue pool. It was a really nice walk (about 3 hours slowly walking). In the afternoon we did the 4x4 trail by car (about 2 hours including stops). The trail is closed by a fence. The guide will get the key so you can get in. The trail is not very long we but we liked it anyway. Good tracks and nice scenery (completely different than in the morning). You can also do a short walk to the rock that has the shape of a boot. 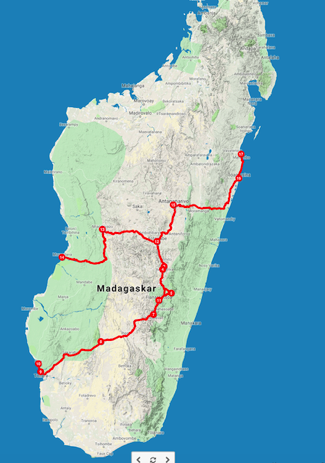 Tulear to Morondava offroad adventure: An unforgetable adventure and for us the best part of our trip to Madagascar. Great offroad driving and beautiful landscapes. We had surprisingly good accomodation on the way. For safety: ask local advise before you go. Antsirabe: We visited the city but we did not liked it very much. Also many annoying souvernirs sellers here. Ile Sainte Marie: Nice island with good accomodation. Great whale watching around the island in season. Whale watching at Ile Sainte Marie: Between July and September humpback whales are coming to the warm waters of Madagascar. They can be found near Tulear and on the east side of Ile Saint Marie. Especially the waters near Ile Sainte Marie are famous for whale watching. We were in the right season and saw many whales. It was an amazing expecrience to see those huge animals jumping out of the water and definitely worth the money. We booked our trip at Hotel Libertalia. The hotel is member of Cetamada, an organisation that does research and works on protecting the whales. Researchers may come with you on board. The evening before the trip an informative presentation was given on the whales. On board the have a hydrophone so you can listen to the sound of the whales under water (amazing). Price is 160.000 Ariary per person. Boat can take up to max. 13 people. Life jackets and a warm sailing jacket are provided. Despite the special jacket we got very wet and cold. On board your are not allowed to wear shoes or sandals (they must be left in the restaurant). Do not wear sweaters or thick clothers underneath the sailing jacket. When that becomes wet you get more cold. A rain jacket however might work. Pirates cementary at Ile Sainte Marie: Within walking distance from the city center (or from Libertalia Hotel). Entry is 2000 Ariary per person. Not very special but still nice to visit. Night walk in Mitsinjo (Andasibe): We skipped it because we were too tired after a long day of driving. The walk however should be wonderful. Price is 20.000 Ariary per person for a 90 minute walk. Lemur Island at Vakona lodge (Andasibe): Entry 25.000 Ariary per person. Touristy but fun to do. There are several islands with some rescued lemurs. The main island has a few species and they are used to people. The lemurs will jump on your head and shoulders. It is fun to smell, hear and touch them. Princesse Tsiribihina (Miandravazo): Half way between Morondava and Antsirabe. Good restaurant wit a nice view and good free wifi. Sakamanga (Antananarivo): Nice hotel in downtown Antananarivo. Hotel has great food and is famous with expats and tourists. When you have a late flight and the hotel is not fully booked you can keep the room until you leave for an additional 50% of the price per day. The hotel can also arrange a reliable taxi to the airport. From the hotel it is a short walk to the city center. Samaria Lodge (Ile Sainte Marie): Very beautiful lodge. Place only has a few bungalows and is often fully booked. It is located at the northern part of the island (1 hour from the harbour; price per tuk tuk is 45000 Ariary) Note: the distance from town as mentioned at booking.com is not correct. Location is not very convenient when you need to catch the early boat back to the mainland. Good restaurant and amazing views. Place has a natural bay for swimming and a view point for whale watching. Lodge is member of Cetamada and also offers whale watching tour. Very friendly staff. Price 57,- per night per bungalow for 2 persons. Libertalia (Ile Sainte Marie): Nice place run by the sister of the man running the Samaria Lodge. Although a bit less luxury we liked this place more. Conveniently close to town and within walking distance of the pirates cementary, near the beach, good restaurant, good Wi-Fi, comfortable bungalows, infinity pool and a nice walk way into the sea. Here the office of Cetamada is located. Whale watching tours can be booked here. Whale watching tours also start from here. Hotel also has a small shop where you can buy goodies and clothes to support Cetamada. Price 48,- Euro per night per bungalow for 2 persons. Here we saw whales (mother and calf) very close to the beach, right in front of the lodge. Hotels in Madagascar in general: Almost all hotels we slept in were good hotels. For information on all the other see info at chapter "waypoints" below. Ranomafana, Chez Gaspard. In the center of the village, clean rooms, good restaurant (we slept in a room in the new big building instead of the bungalows). Price 58.000 Ariary for a double room. Tsaranoro valley, Camp Catta. Beautiful place were ring tailed maki's raom freely, natural pool, good restaurant, nice hikes from here. Price 60.000 Ariary per night for a comfort tent. Can be cold here at night. Andavadoaka, Coco Beach. Nice place. Great view of the ocean. Andavadoaka is located at the edge of the reef. Good snorkling here. Near the lodge is an island you can visit. Food was good. Good Wi-Fi. Bungalows were basic but OK. We did not had hot water though. Price 50.000 Ariary per night. Belo sur Mer, Blue Ocean lodge. Basis but clean bungalows right next to the channel (the beach is a bit further away). The bed was new, large and very comfortable. Very friendly owner. Also here they can make a very good fish stew. Also good fried fish. Price 60.000 Ariary per night for a double room. Morondava, Hotel Trecicogne. Good place but very touristic. Good Wi-Fi at the restaurant. Room were good and clean. Price 89.000 per night for a double room. Andasibe, Feon'Ny Ala. Very large and touristic place near the entrance of the NP. Place has many bungalows. Try to get a bungalow with nr 100-200 and with river view. If you are lucky you might see and hear the Lemurs from here. Place is located in the rainforest and bungalows were chilly and moist. Very hot shower. Good Wi-Fi (at the restaurant). Good food at the restaurant (service is slow). Price 87.000 Ariary per bungalow per night. Mahambo, La Piroque. Nice place next to a quiet beach. Nice rooms and bungalows all surrounded by a nice garden. Very good restaurant (we loved the vegetarian chick peas here). Wi-Fi at the reception. Hotel can make reservations for the ferry (El Condor) to Ile Sainte Marie. The ferry leaves from the beach very close to the lodge. For a small fee you can park your car here when you visit the island. Price 99.000 Ariary for a double room (bungalows are more expensive). Isalo NP, Office NP. Get your tickets here. You must also pay for your guide here. When you have not arranged a guide through the hotel, you can book one here. N25, Junction is end of the off road piste (short cut) to Ranomafana (coming from Antsirabe). Nice detour. N25, Junction is start of the off road piste (short cut) to Ranomafana (coming from Antsirabe). Nice detour. Ambalavao, paper factory. Visit is free of charge. Good restaurant for lunch here. Ranomafana, Entry to NP. Entree fee to be paid here. Also guides available here. Miandrivazo, Princesse de Tsiribihina. Nice restaurant half way Morondava and Antsirabe. It is also a hotel (did not sleep here). Restaurant has a great view, good Wi-Fi and very good sandwiches for lunch. Salary, local restaurant. The best fish stew of the whole trip. Very cheap but delicious.